Lihaug’s coach Hansvoll: "Abraham has lost his hunger!" Thomas Hansvoll expects Tim-Robin Lihaug (15-1, 8 KOs) to upset the odds and score a career-defining win over former two-weight World Champion Arthur Abraham (44-5, 29 KOs) on July 16 at the Max-Schmeling-Halle in Berlin. The Norwegian duo have been hard at work preparing for the WBO International title fight, and although Lihaug enters the bout as an underdog, Hansvoll is confident the 23 year-old has what it takes to beat an ageing Abraham, who he believes has ‘lost his hunger’. ‘’Abraham is a legend in the sport, but I think he has lost his hunger,’’ says Hansvoll. ‘’I’ve watched all his fights so I know a lot about him, and I’ve been a boxer too so I can tell when a fighter is a little tired of the whole thing, and I think that is the case with Abraham. He has been there and done that, and he’s not so interested anymore. ‘’I don’t want to say anything bad about him because I respect him as a fighter, and he was a hero of mine, even when I was fighting, but when you get older and you’ve made a lot of money, it can be hard to find the motivation. You can see that in his last two fights against Gilberto Ramirez and Martin Murray. He doesn’t have the same hunger anymore, and it’s sad to see. Hansvoll, a thirty-two-fight veteran and former World title challenger, says he intends to draw on his own experience inside the squared circle to guide his fighter to victory. 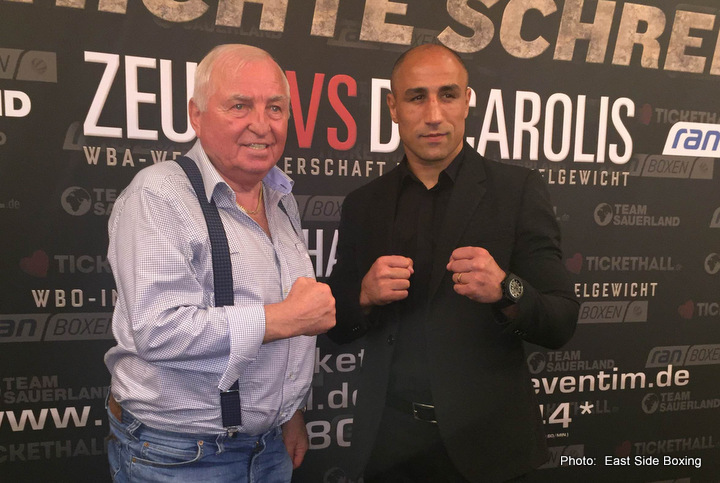 The WBO International Championship fight between Tim-Robin Lihaug and Arthur Abraham will provide chief support for Tyron Zeuge’s WBA World Super Middleweight title challenge against Giovanni De Carolis. Tickets are available online via www.eventim.de and www.tickethall.de or by calling +49 (0)1806-570044.